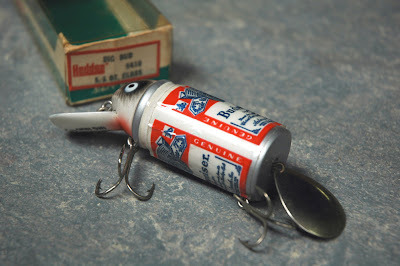 The Heddon "Big Bud" fishing lure was introduced in the 1970's as a Budweiser advertising gimmick but, wisely, both Heddon and Budweiser presented the lure as straight-up tackle and resisted explaining the joke. Packaged with fishing instructions and in a box looking like every other fishing lure in the line, the Big Bud was advertised as being effective for bass, northerns, pickerel and muskies. If your curiosity remains unsatisfied, there is an extremely detailed history on the Big Bud lure - including the sad tale of Budweiser pulling their licensing agreement as they moved their marketing power from fishing to extreme sports.